"As I enter this new year, I will still ask questions, have dreams, and yes, even make plans, but hold onto them loosely. In 2018, I will choose to cling tightly to the only permanent thing in a world full of temporary - the hope I profess in Christ (Hebrews 10:23). In 2018, I will cling to God's promises and His truth, with the assurance that He is working in all things for my good and His glory (Romans 8:28)." A few days into the new year, God gave me a single word: light. I saw it everywhere - in Scripture, in books, and in everyday life. One night as I was driving home from a church service, I saw the biggest, brightest full moon. As I looked straight ahead, I noticed how brightly it shone in the darkness, as if guiding me home. In that moment I knew God was showing me that 2018 would be a year of light. The thing about light is that it shines brightest in the darkness, and darkness would certainly follow. A few weeks into 2018, I was faced with a decision that launched me into one of the most difficult seasons of my life. Many nights it felt as if I was grappling around in the darkness, but the Light was always there. "The Lord is my light and my salvation - whom shall I fear?" Although it seems silly, I used to think I had to be afraid of someone to relate to that verse. But I've realized that oftentimes it's not someone that we're afraid of - it's something. As you can probably guess from last year's post, my something was uncertainty, not knowing what the future holds for me. 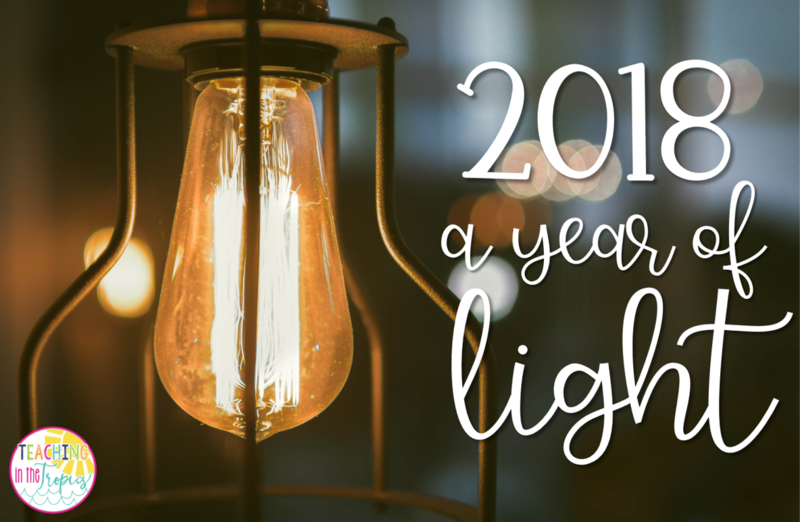 But in 2018, I learned that God is my Light, and the darkness is not dark to Him (Psalm 139:12). I learned that this means I will follow Him, even into the darkness and uncertainty, because He will lead me where He wants me to be. In the midst of the darkness, He led me on several new adventures, including the pursuit of a master's degree in Ministry/Women's Leadership and attending my first Teachers Pay Teachers Conference. Both of those new adventures were a step outside my comfort zone, but through them I also learned that God created me to be a light that reflects Him. "You are the light of the world. A town built on a hill cannot be hidden. Neither do people light a lamp and put it under a bowl. Instead they put it on its stand, and it gives light to everyone in the house. In the same way, let your light shine before others, that they may see your good deeds and glorify your Father in heaven." As a teacher, this means I am a light for Christ in my school and in my classroom. I am blessed to teach at a Christian school where I can worship and talk about the Lord with my students. However, I have learned that my words and actions - the way I interact with students and coworkers - are the biggest reflection of Christ that I have to offer. I have failed to be a light on many occasions, but God is teaching me day by day to abide in Him so that His love and light shine out of me (John 15:4-5). 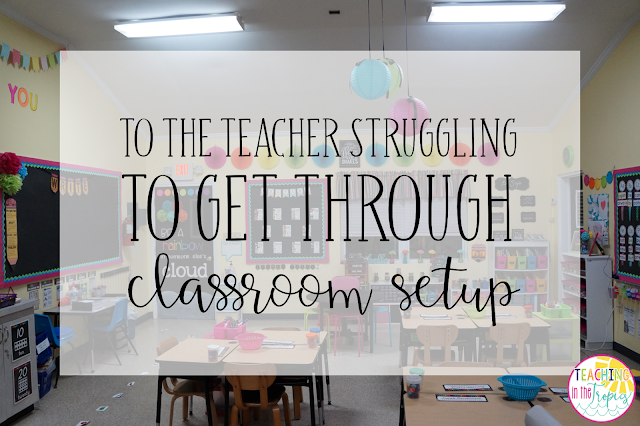 In the summer, as I was getting ready for the 2018-2019 school year, I decided to carry the theme of light into my classroom. I used light bulb clip art on my door and student work board, and added the quote "Let your light shine!" to my wall. I also created light themed Bible verse posters and hung them on the outside wall of my classroom, so I would read those precious truths every time I come and go each day. Everywhere I turn, I'm reminded that God is my Light and I am created to reflect Him. Over the last couple of days, I've seen a lot of posts on social media saying things like "2018 was good to me" or "2018 just wasn't my year." I really don't know if 2018 was good to me or if it was my year. But God was good, and He never stopped being my God. He is good, even when the circumstances of my life are not, and His love is unending (Psalm 107:1). Romans 8:28 reminds me that He works in all things, good and bad, for the good of those who love Him and have been called according to His eternal purpose. And because of that amazing promise, I think of 2018 and rejoice. "Rejoice always, pray continually, give thanks in all circumstances; for this is God's will for you in Christ Jesus." I have a confession to make. 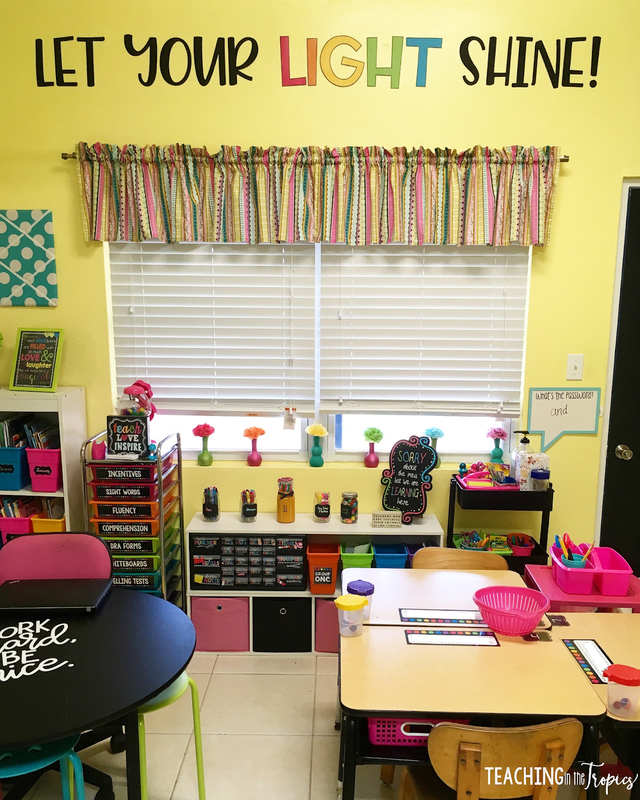 Do you see this classroom in the background of my blog post header, my 2016-2017 classroom? At one point, I didn't know if I was going to get through with setting it up. One day during classroom setup, I found myself sitting on the floor, slumped against the cabinets, breathing deeply and choking back tears. Not because the work was overwhelming. On the contrary - that was the one year I hadn't had to move classrooms, so a lot of my bulletin boards and posters were still set up from the previous year. Yet I was still struggling to get through my classroom setup because I couldn't seem to focus. I was going through an extremely difficult time in my personal life and that day in particular was probably one of the hardest days yet. I remember wondering how I could possibly finish what I had to do over the next few days when the dark cloud of my current circumstances seemed to loom over me at every turn. Even the bright and happy colors of my classroom couldn't change the overwhelming feelings that I felt. I'm sharing this not for pity, but to let you know that you are not alone. We are teachers, but we are first and foremost human beings. We have our struggles, things we go through in our personal lives, and we bravely shut the door and push them aside as we teach our kids each day. But during the summer, with more time on our hands, we often have to face these struggles head on. And that may mean that when the time comes to go back to school and start setting up, we still don't feel ready. That day during my classroom setup occurred just a few months after I made the most important decision of my life - to serve God wholeheartedly. (You can read more about that decision here and here.) 2016 had been a difficult year for me, one that I knew I wouldn't be able to get through without the Lord. And two years later, I can say that I was definitely right about that. But in that moment, while slumping against my cabinets, I wasn't even sure if God could help me. I wasn't sure about anything, especially about how I was going to make it through the next few days. But in the midst of my struggles, I learned something important. God's grace is sufficient. In 2 Corinthians 12, Paul writes about a "thorn in his flesh" (v. 7) - not an actual thorn but some kind of ailment or weakness that he was struggling with. He goes on to say, "Three times I pleaded with the Lord to take it away from me. But he said to me, 'My grace is sufficient for you, for my power is made perfect in weakness.' Therefore I will boast all the more gladly about my weaknesses, so that Christ's power may rest on me. That is why, for Christ's sake, I delight in weaknesses, in insults, in hardships, in persecutions, in difficulties. For when I am weak, then I am strong." (2 Corinthians 12:8-10). Oftentimes, we wish, just as Paul did, that whatever difficulties we are facing would just go away. But God has taught me that our difficulties, limitations, trials, and failures are an opportunity for Him to show His power in our lives. When we are weak, He is strong. There's a quote by author Wendy Mass that says, "Be kind, for everyone you meet is fighting a battle you know nothing about." I don't know what you may be going through right now, personally or professionally. 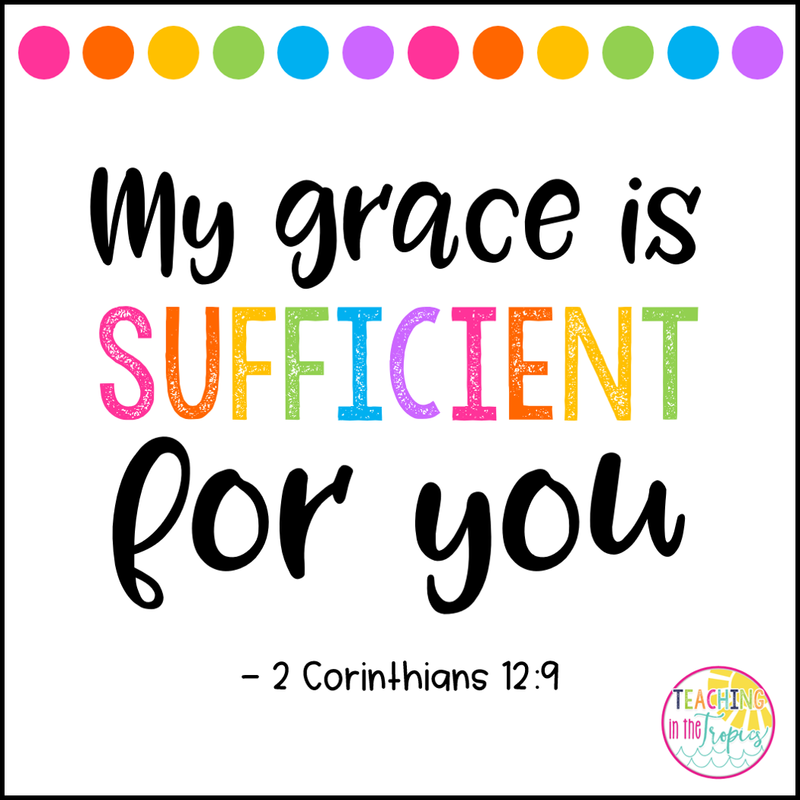 But I do know that on our most difficult days, God's grace is sufficient to carry us through. As you return to your classroom and begin setting up, I want you to know that it's okay to not be okay. It's okay if you find yourself on the floor, like me, holding back tears. And it's okay if you let them all out. It's okay to not know when you're going to feel okay again. In our darkest days, God's light shines brightest; the darkness is not dark to Him (Psalm 139:12). He is so much bigger than our current circumstances and nothing will ever be able to separate us from His unending love (Romans 8:39). If you are reading this and feel led to reach out, feel free to comment, email me, or message me on my Instagram account. I would be honored to offer a listening ear and pray for you. Five for Friday: It's Been a Busy January! Monday Made It: I've been busy!